I don’t know about you, but I love me some Sriracha sauce! Just the thought of it makes my mouth water. It’s my go to sauce for just about everything…pizza, on top of pasta, on my eggs, in my soup, the list could go on and on. So I decided to make it as a marinade for my chicken and let me tell you… it is so delicious! Just the right amount of kick with a dash of sweetness. Can you tell I’m obsessed? Just wait and see…you’ll be too! Coat the bottom of the pan with olive oil. Place chicken in pan (try not to overlap them). Grate a little lemon zest over each piece of chicken. In a small bowl whisk together lemon juice, Sriracha, brown sugar, salt, and a pinch of pepper. Pour sauce over chicken. Cut lemon into circular slices and place over chicken. Cover with foil and put into oven. Cook for 45 minutes, then remove foil and cook another 25 minute or until chicken is golden brown. Sprinkle with scallions and serve. 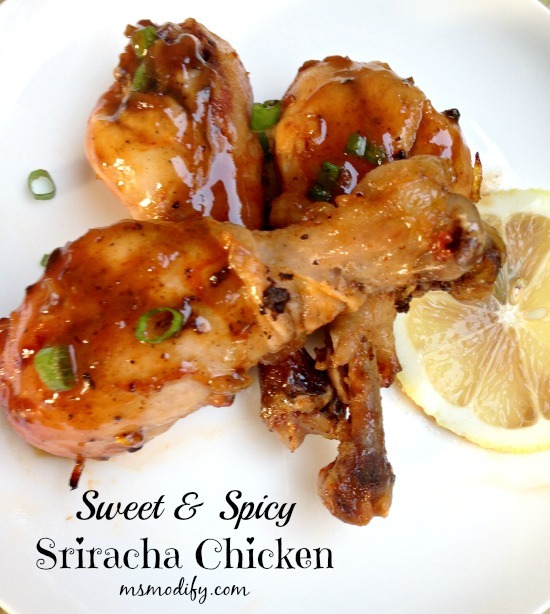 This entry was posted in Recipes/Dining Out and tagged chicken, dinner, entree, spicy.